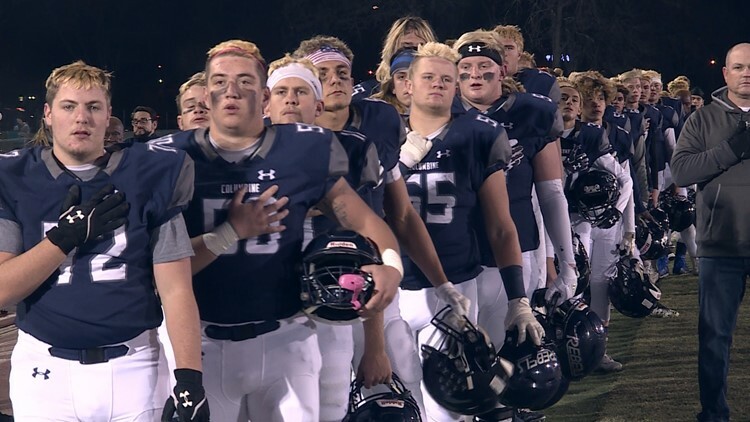 Columbine rolls past Highlands Ranch to advance to 5A state quarterfinals. DENVER — Columbine rolled past Highlands Ranch 49-7 on a frigid Friday night in Round 2 of the 5A state football playoffs. Rebels senior quarterback Logan DeArment had a massive night, tossing two touchdown passes, rushing for three scores and capitalizing on a two-point conversion. Highlands Ranch only score of the night came midway through the second quarter, courtesy of sophomore quarterback Jake Rubley and a six-yard touchdown pass to senior wide receiver Lance Opp. The Rebels capped off a dominant first half with a touchdown and two-point conversion in the final two minutes to head into the break leading 29-7. The Columbine defense kept Highlands Ranch scoreless through the second half to wrap up their 11th straight win of the season. They move on the quarterfinals where they will face the winner of Arvada West-Pomona.